BINGO is super cute but missing home and he showed up with no Microchip or Tag. He needs some help now.. I met This boy today at Carson Shelter. 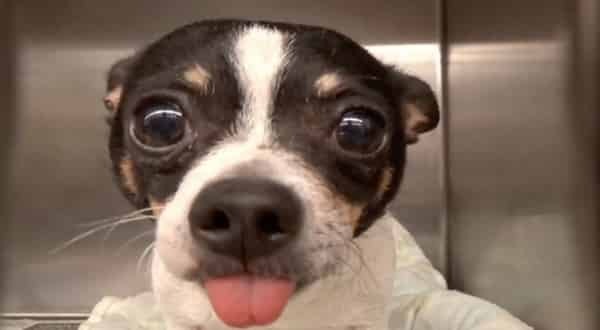 He is a chihuahua 13 years old he has zero chance of making it out alive sadly. He is so very sweet and loves people. Gives gentle kisses and loves any human attention. Pls go by and let him before he is gone forever. No one wants This boy. Poor baby is so thin. But yet still loves people. Go figure. Pls share him or rescue or foster if u have room. He is worth a chance. Thanks. #A5133604 My name is BINGO and I'm an approximately 13 year old male Chihuahua. I am not yet neutered. I have been at the Carson Animal Care Center since 11/29. I will be available on 12/3. You can visit me at my temporary home at C403. 1 Response to "At 13 years old of his age, this senior chihuahua has zero chance of making it out alive sadly"